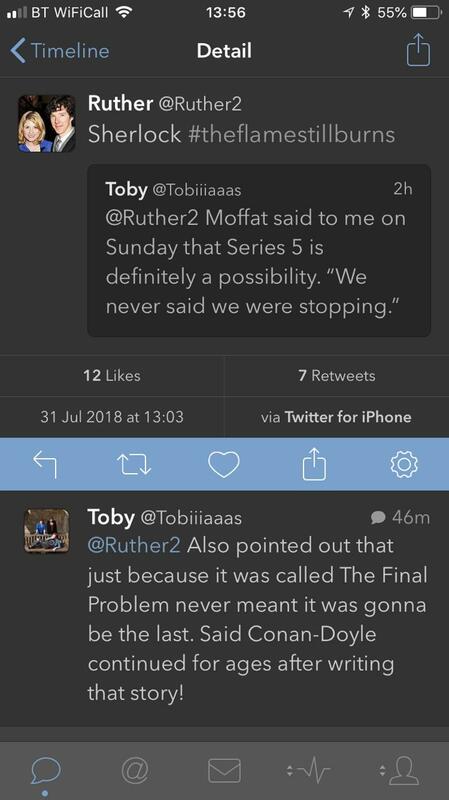 Let's hope, and let's hope that yes, Season 5 is a go! Ooo, interesting. Looking forward to the Q&A! Although I'm sure we will only get the answer we've always been getting about S5. But in this case why do the Q & A at all? Tumblr users are all over the world, the escape room will be in London. 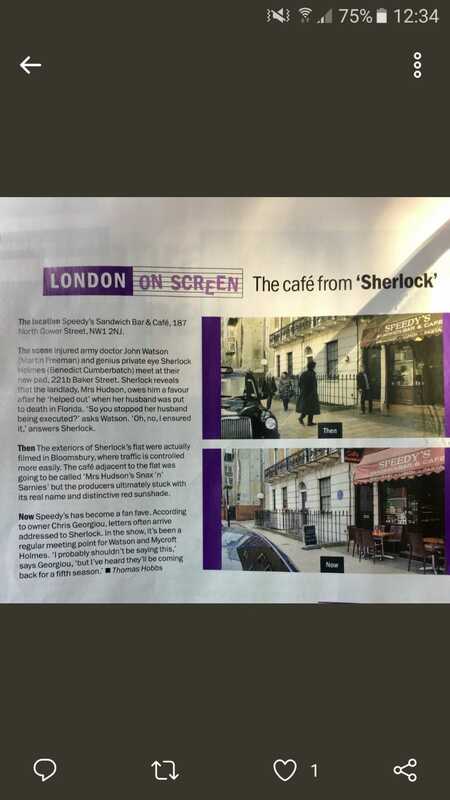 They must know that only a fraction of Tumblr users - provided they are still interested in the show - will be able to go to London. And declaring a "Summer of Sherlock" just for something happening in the autumn which only a relatively small group can afford? Well, there are other questions to ask than just "When will we get S5? ", but I am sure that will be one of them. I am not for a second believing this is PR for something new, that is just to set myself up for disappointment. I will just prefer to be proven wrong and be happily surprised if I am. I don't think there will be anything earth-shattering about S5, because I don't see them starting filming in the summer. It's just possible that they could announce plans for later, but I don't think that will be the big reveal. The good news, though, is it does seem as if they're going to reveal something else. If the escape room isn't until autumn, then it does look as if they're going to do something to keep the interest going. And tumblr maybe suggests they are aiming at a young adult audience? And good point about it being worldwide, Susi. Maybe something online? Maybe a release of outtakes, etc., either DVD or streaming? Maybe an online escape room game? I fell for the hype of S4 and was expecting more to be going on outside of the show itself (all the talk about groundbreaking TV! ), so I'm a bit wary of being caught up until I see something more concrete! Yes, I am still wondering what was so groundbreaking about S4. Well it certainly caused great schism in the fandom! Didn't it turn out in the end that the groundbreaking thing was Sian being in disguise for the first couple of episodes? I suppose in retrospect, it was a pretty clever idea and well done (Sian being brilliant as all the characters!). It was only spoilt because some of us had been watching her in Setlock and then spotted her as a different character in TST! But yes, a clever "mystery" touch within the show, rather than something that was groundbreaking and new for television in general. Anyway, I got all prepared for something major and turned out to be something good, but more minor. So I'm being a bit more cautious this time! 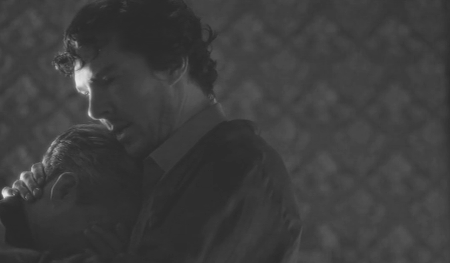 A sister instead of a brother, the tragic loss of Victor(and not a dog), Moriarty's tentrails...dunno, it all worked for me. I am very happy to hear all this because for me TFP would not be a satisfying ending at all for me. Editing to add: I was hearing on the radio that Poldark (BBC) would not be made in the same way if it started now. They had struggled with the budget, and if it was made now it would probably be a collaboration between the BBC and one of the big international companies like Netflix. I was just wondering if that was a possibility with Sherlock, as there are so many viewers outside the UK - if the BBC could bring in another big company? I am personally quite satisfied by TFP as an ending, but would of course want more. As for S4 being the last, no one has ever said it would be. So to me it seems that it's still the same status quo as it's always been. Yeah, must admit...nothing new here for me, but not in a bad way!